Mu Shu was always my favorite Chinese dish to order when I was a kid. There was something special about it because you got to assemble it at the table and slather on the thick, dark and sweetly-rich hoisin sauce. 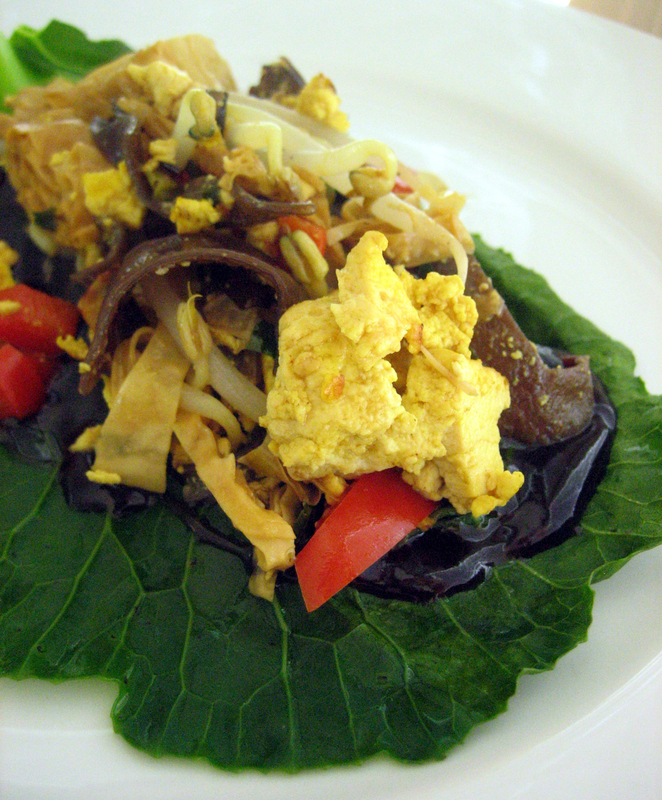 Thing is, like the machaca, Mu Shu is traditionally loaded with animal proteins. Since that just wouldn’t do, I needed to figure out another way to create this classic Chinese dish. Once again, I turned to yuba because it has that wonderful chewy texture and takes on the flavors of marinades very well. Another part of this dish that I wanted to reinvent was the wrapper. Rather than use a Mandarin pancake, which is simply white flour and water and brings nothing of nutritional value to the plate, I chose to use a supple steamed collard green leaf that is full of iron, calcium and fiber. I also added red bell pepper to the mix in order to add a healthy dose of vitamin C so that the iron and calcium in the collards would be more readily assimilated. This meal was fantastic and one that I shall make often. Everything is better in a collard green! Great recipe! Marti, I taste-tested this on myself, Heather and Judy. It’s* amazingly*good and the collard works perfectly!